As British Gypsum celebrates 100 years in the industry it wants to champion the trade and has been out on the road meeting some of the unsung drylining heroes. 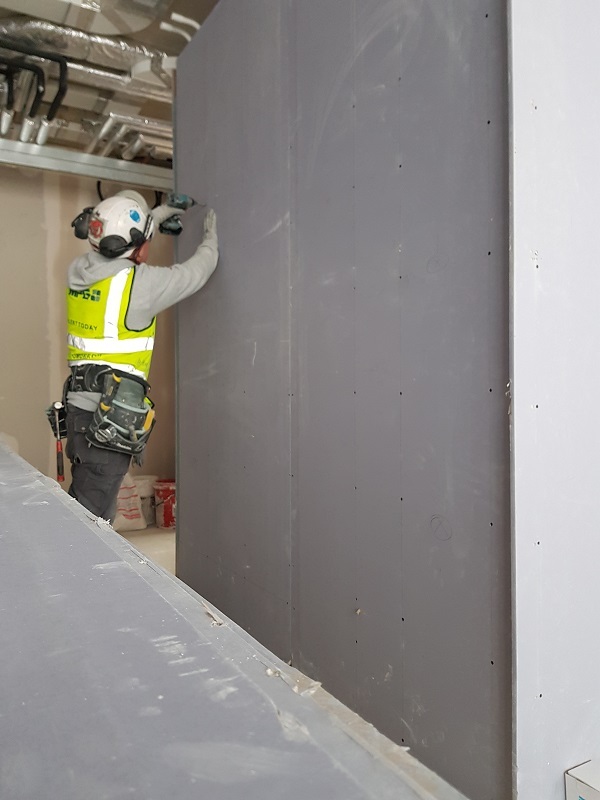 British Gypsum catches up with drylining apprentice Sean Dooner. Similar to plastering, drylining is another skill that takes years to master and yet it often goes unappreciated – by its very nature, if it’s done well, it’s designed to go unnoticed. Before I started work in the building trade I was a full time carer, looking after a vulnerable person for 7 years. Unfortunately, the person whom I was caring for passed away and I had to begin looking for new work. My plan was to go back to college and expand upon my current skillset. I’d previously worked within the painting and decorator sector, but figured that if I had to go back to school I might as well work in a new trade. Drylining appealed to me most, as it’s mainly indoor work, so I wouldn’t have to worry about the weather. It can be difficult transitioning from one career to another, but fortunately I was able to speak to careers advisors at the college who pointed me in the right direction. Having that support enabled me to reach out to numerous firms and see if there were any opportunities available. It’s still a tough road, and can bring up many disappointments, but after a lot of perseverance I was offered a trial shift as a labourer with MPG Contracts who then went on to offer me an apprenticeship. For more from this series of articles click here, here and here. I believe apprenticeships offer the best route into the trade and provide a level of job security that’s simply not available if you’re trying to freelance. Undertaking an apprenticeship with MPG Contracts has allowed me to build up a solid skills-base under the tutelage of more experienced tradespeople. I’m now really confident in my ability and have been able to reach this point whilst also being paid. What’s more, the company have paid for a lot of my tools and workwear, which is a big advantage when you’re just starting out. I was able to show off my ability recently at the nation’s largest skills, apprenticeships and careers event, the Skills Show. Alongside a number of plasterers and dryliners, I took part in the Plastering and Drywall Systems competition. British Gypsum’s National Technical Training Representative, David Kehoe and Colin McCaughey of the Construction Industry Training Board set us an ambitious but achievable task to finish a build from start to finish before the event was over. The level of competition was excellent and nearly everyone managed to get the work completed within the given time frame. It was a real honour to be named the winner – being recognised by my peers has also reaffirmed my confidence in the skills I’ve learnt during my apprenticeship and further vindicated my decision to pursue this path. Throughout my time in the trade I’ve frequently used British Gypsum products and found them to be superb. We’ve used most of their plasterboard products from Gyproc Moisture Resistant to Gyproc SoundBloc. I’ve also found the company’s CasoLine MF ceiling range to be very impressive, as well as its Gyproc Habito plasterboard. However, their Drywall Screws are without doubt my favourite; I love them as they just go through the metal so easily. It means I don’t need to use loads of pressure and wasted effort with screwdrivers. I believe the industry is currently in a good place, especially in London where there seems to be a constant stream of work. At the moment I’m fitting metal stud walls, MF ceilings and dry walls on a daily basis, which makes me happy with my choice of career. I’d like to see the industry capitalise on this momentum and further extend efforts to bring young people through into our industry. There’s so much untapped talent around the country that could do wonders if given a chance to shine. Personally, I’d like to see further effort made to get into schools and showcase the work. Demonstrations really work as it gives people a much better understanding of what the role entails. During my time at Skills Show I couldn’t believe the level of attention our showcase area was receiving. It’s important we take this intrigue and transition it into new talent. I believe apprenticeships are the best way to do this as not only do they provide a steady stream of work, but the necessary education and guidance you need to make it as great dryliner. Faced with the prospect of having to change careers, Sean Dooner is a fantastic example of how apprenticeships bring real talent into the drylining sector. Look out for British Gypsum’s next interview in the next issue. Is your apprentice the nation’s number one?